Qbao Network is a smart crypto-wallet and platform. It aims to build the blockchain ecologic platform and to create the entrance to blockchain world. It integrates multi-function with cross-chain Cryptocurrency Wallet, Payment & Settlement, Token Exchange, Social Network, News & Quotes, and DAPP Store. Qbao Network serves global digital currency users, by providing users with cross-chain, decentralized, secured and easy-to-use digital asset platforms. Qbao Network is an one-stop application that meets the needs of people in digital currency payment and settlement, digital asset management, digital asset trading, online consumption, identity authentication, news, and social communication. It provides global users access to digital economy and life. 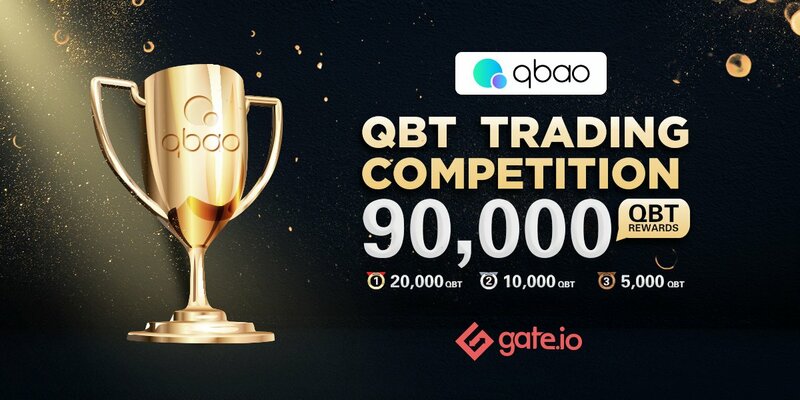 Follow our twitter @gate_io , retweet QBT Trading Competition post and join QbaoNetwork telegram: https://t.me/QbaofoundationEn to get random amount of 10,000 QBT Airdrop during the period from 05 June to 10 June ,2018. Please follow our twitter @gate_io to know more details. During the activity time, the top 100 traders will share 90,000 QBT based on their QBT trading volume calculated by the formula: (buy amount + sell amount) x (time factor) .Same account trades are excluded. (time factor) decays linearly from 1.5 to 1.0 during the competition.